The light switches within any home have a general lifespan that are dependent upon a variety of different factors. Unfortunately, trying to determine exactly when a light switch replacement will be necessary is an inexact science that begs for hints in order to be prepared for the inevitable. 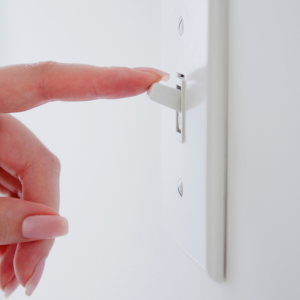 In truth, there are distinct ways in which the need to replace light switches can be spotted. From that point. any light switch installation can be handled by a residential electrician, though it’s becoming increasingly popular to install smart light switches. That’s because of the cost savings that can be seen over that subsequent lifespan. Flipping a light switch on shouldn’t bring with it any attention, yet your ears should immediately perk up if a noise is heard when that happens. It can be the sound of crackling or popping that sharply resonate, though in some cases, a hissing or buzzing noise might be what comes through. Regardless of what that noise turns out to be, it’s a clear indication that real trouble could be on the horizon. Noises like that simply don’t go away on their own and could be indicative of a possible fire down the road. Gambling that won’t be the case is a dangerous bet that isn’t worth taking. Seeing is believing when it comes to discovering you need to replace light switches, since clear signs will emerge without much effort. All you need to do is see lights go off without anyone touching a switch or watching lights flicker in such a way that the need for a change becomes obvious. Another way may be more subtle in nature since it will depend on the intensity of the light that’s being used. If other lights become slightly dimmer when either turning on or off another light. a problem exists. Finally, another simple visual will note when a switch plate looks either darkened or has a look of being scorched. If it’s reached that point, light switch replacement should be high on your agenda. Older house have a charm all their own, yet those that are more than four decades old likely have an outdated setup in place. That type of situation is tailor-made for an upgrade that would include having a residential electrician install smart light switches. A new light switch installation can be an investment in the future that can pay for the visit by that electrician. That comes through the energy savings that can accumulate over the ensuing years, through the use of dimmers and other concepts that keep a close watch on your energy usage. A light switch can often feel warm, but when there’s an uptick in that warmth, it’s a cause for concern. Wiring issues can be the source of the problem, with too much voltage surging through this area. That’s a potential fire in waiting, which means that immediate attention is absolutely necessary. The immediacy that comes when a light switch is flipped should be instantaneous. However, light switch issues are evident when there’s a delay of a few seconds before a light comes one. That’s a clear indication that the wear-and-tear on the electrical contacts within the switch is getting worse. This is another case where ignoring the problem won’t solve the issue, which means getting in touch with an electrician is your best move. Getting in touch with J&B Electrical Services to either inspect or replace light switches is an easy solution to such problems. The residential electrician we send out can repair, replace & upgrade electrical components and light switches, helping ease your mind. So whether you’re looking to upgrade to smart light switches, need simple light switch installation or help with any other electrical issue, contact us at 817-266-5499 or fill out our online contact form.